Let us open their eyes to exciting new skills, experiences and insights into the history of surf culture and the education of beach environment and water safety. All teachers and leaders come along for free and discounts for large school groups. Transport can also be arranged for local schools. Learn to surf with a Water Skills Academy Accredited Surf School. With years of surfing experience we guarantee a successful lesson full of fun. All water based tuition will take place in waist deep water for maximum fun, safety and learning. Enjoy a combination of activities on this action packed day of Surfing, Surf Lifeguarding & Beach Challenges. Create a package designed around your group. 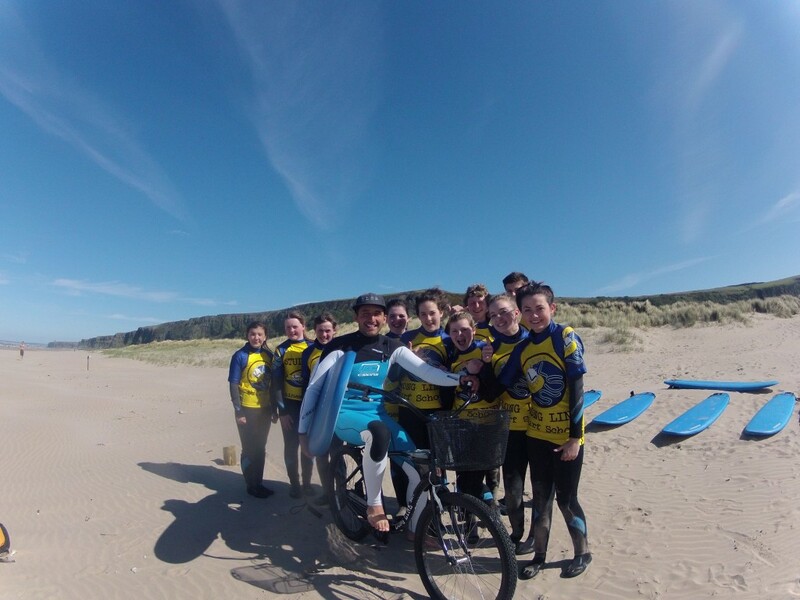 One night’s accommodation and a full day and half of activities: Surfing, Surf Lifesaving, Team Challenges, and a range of other activities all within the Area of Outstanding Natural Beauty (AONB) . Two night’s accommodation and 2 days activities. Accommodation/Meals: Grade A Hostel Accommodation or Hotel Option for large groups. Breakfast, Packed Lunches, Evening Meals & Evening Entertainment can be provided. Contact us to talk over the choice of options. Help look after our coastline and let us organise a beach clean for your school. All equipment for litter picking will be supplied. Available for beaches all along the North Coast. School Packages can also include other activities included in our bespoke package list. Surfing does not need to be part of the programme as Surf Lifesaving or Beach Challenges can be organised as a single session. Contact us so we can share ideas and come up with the best school trip to fit your budget.